This soapstone and cork foot massage set provides instant relief through the healing power of reflexology. This rock-and-roll reflexology set will be music to your feet. A way to give yourself an effective foot massage, the smooth soapstone balls can be used heated for just a quick few minutes at home to provide relaxation and relief to tired feet. 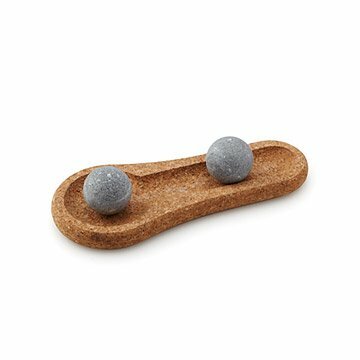 Place one ball at a time in the cork base and, while sitting, massage the most tender points of the soles of your feet. Made in Finland. The stone balls can be cleaned either in a dish washer or by hand. If necessary, you can clean the cork base by hand, with a little soap and water. Allow the cork to dry completely before using it next time. In order to be effective the stones used in this kind of therapy have to stay warm for long period of time. The amazing heat retaining capacity of Finnish soapstone has been used for centuries. These therapy stones have been crafted from this, over two billion years old, unique natural stone. Place the soapstone balls at the bottom of a small, heat-resistant bowl. Pour hot water over the stones until they are completely submerged. When the water has cooled so that you can safely place your hand in it, remove one of the balls from the bowl. Leave the other ball in the water, so that it stays warm. Dry the surface of the stone and, when still warm, place it in the shallow recess in the cork base. Place the cork base on the floor. Sit in a relaxed position and massage the tender areas on the sole of your foot, either cross-wise or along the length of the foot. After massaging one foot, exchange the ball in the cork base for a new, warm one and repeat the process for your other foot. The combination of warmth and pressure is extremely relaxing and pleasant. Warmth conveyed via the feet reaches the entire body. You may also perform a foot massage without warming the stones. We don't, just pass it on as a gift. Great for people who are on their feet all day or people who suffer from foot issues!!! My mom uses it at least weekly. This is a great item for someone sitting at a desk all day. Great way to massage sore feet. I am excited to give this as a gift to my sister. She has foot problems and I believe this would be more effective than using a tennis ball. It was given as a gift. She loves it. I will send this gift to more friends! Simple to use, feels great on the soles of your feet especally if you warm the sandstones! Very cool product but packaging was weird? This is a cool unique non-western medicine product. Its form and function are perfect for people with plantar issues.